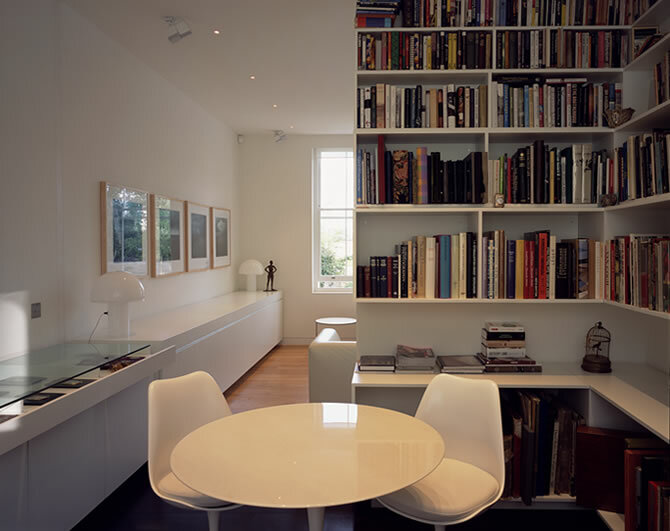 The practice was appointed by an eminent rare books dealer to convert and extend a Victorian house in Hampstead, North London, an area famous for its tradition of experimental 20th century residential architecture. Not far from this house in Pilgrims Lane is Erno Goldfinger’s Willow Road development and the steel-framed glass Hopkins house. The Pilgrims Lane property included the site of an existing single storey garage. This enabled the practice to obtain planning consent to build a two-storey extension with an additional lower ground level, doubling the size of the existing house. 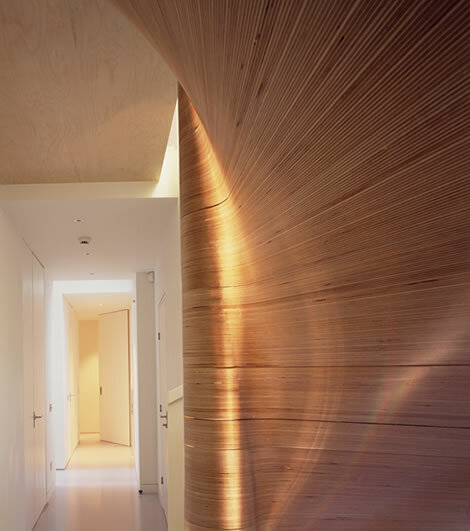 Each floor is linked to the refurbished Victorian house producing unusually generous living space at ground floor level. The design marks the first of a series of abstract street facades by architect Nick Eldridge. 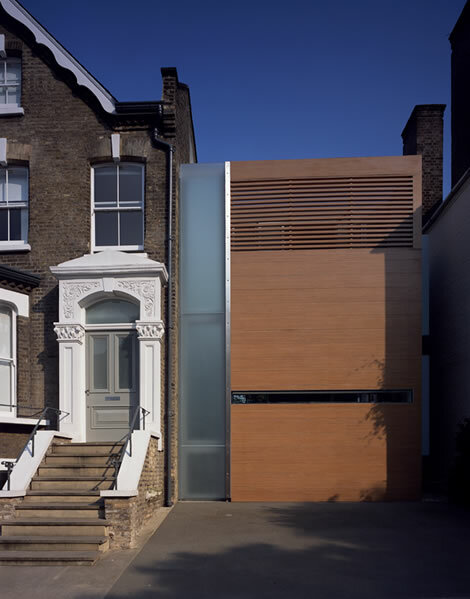 The cedar clad wall and translucent glass of the extension provide few clues to the space behind which then opens up to the garden with an entirely glazed rear elevation with balconies. 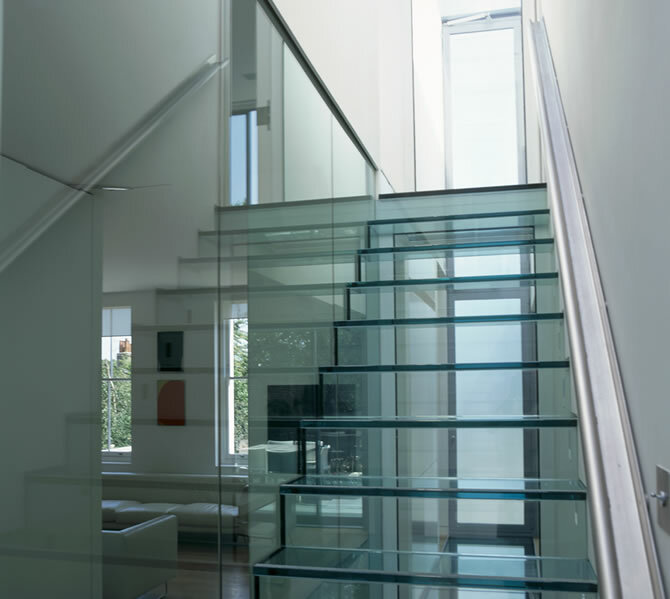 The transition between the 19th and 21st century structures is expressed by a one metre wide space between the two containing glass staircase, glass floors and with a glazed roof flooding the interior with natural light. The family’s overriding experience of life in the house is of calm created by the natural palette of materials and spatial quality of the design. The project won an award from the Civic Trust and the 2003 Camden Building Quality Award.